Our Implant Dental Clinic has 3 Implant Specialists. We are a One-stop Tooth Implant Center for permanent tooth replacement with Teeth Implants. We now offer cosmetic natural dental implants that are tooth colored, metal free and made of zirconia. Call us today for a complimentary consultation including X-rays at 301-770-2270. How to do a Full Mouth of Permanent Implants? It is possible to place 10-12 dental implants and replace a full upper or lower mouth of teeth by placing porcelain crowns and bridges on top of the implants. And of course, if another 10-12 Dental Implants or a total of 20-24 Dental Implants are placed properly in an upper and lower jaw, an entire mouth of teeth can be permanently replaced with single porcelain crowns and porcelain bridges. Back teeth including molars & premolars are normally best replaced with single dental implants and crowns. Front teeth are best replaced with 3-teeth implant bridges. What is the Best Way to Replace a Full Mouth of Teeth with Dental Implants? Replacing a full mouth of teeth with single implant crowns and bridges is the best way to replace a full mouth of teeth with dental implants. The solution feels very natural since the size of the teeth are very close in size to the teeth being replaced. Since the back teeth are individual crowns, they floss, feel and function very similarly as natural teeth. All on 4 implant teeth cases and Implant Dentures are one piece and are bulkier and lager than individual crowns and bridges as in this case. Implant Dentures are made of acrylic and feel less natural and more like plastic than Zirconia used in many All on 4 and full mouth crown and bridge teeth. All on 4 Implant bridges are now quite a bit thinner than their Hybrid Denture predecessors. Most All on 4 cases are now made out of zirconia. There are 2 kinds of Zirconia All on 4 Full mouth bridges: Prettau Implant bridges and Bruxzir Full Arch Implant Teeth. Most people with single tooth dental implants report the implants feel like teeth, chew like teeth, look like teeth and really are indistinguishable from their other natural teeth. Porcelain Crowns on dental implants also feel the same as porcelain crowns on natural teeth. Porcelain has a very similar feeling as enamel on natural teeth, but the porcelain is a little smoother. When is the Best Time To Place Dental Implants? Should I let it heal or do Implants the day of Tooth Removal? Replacing a Full mouth of Teeth with single crowns and bridges supported by Dental Implants is typically best done at the same time or shortly after extraction of the natural teeth. These cases also require minimal loss of gum and bone tissue. The amount of gum and bone loss often dictates the best implant option. We offer Natural Bone Grafting in cases where there has been bone loss and there is not enough for implants. For example, a Denture has teeth and pink gums built into the case. A Denture therefore is replacing both lost gum, lost bone and missing teeth. If there has been significant gum and bone loss, the Dental Implant case will at the very least contain longer than usual teeth and often times pink tissue prosthetically replacing lost gum tissue. An All on 4 Dental Implant case is a one piece bridge replacing an entire arch of teeth in one piece. The All on 4 Dental Implant case includes replacement gum tissue and teeth. 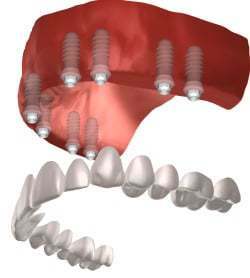 Because this same bridge replaces gums and teeth, the prosthetic is larger and bulkier than the single crowns and bridges option which only includes tooth replacement and no gum tissue. In the later case of single crowns and bridges, the teeth profile is more natural because the prosthetics consists only of teeth similar in size to the lost teeth, hence the reason the option is normally available only to people who have recently lost their teeth. Individuals who have been missing teeth for a longer period of time or who have significant gum and bone loss need to select full mouth dental implant options that replace teeth, gums and bone. Such Full mouth implant options include All on 4, and Implant Dentures when replacing all their teeth with dental implants. Natural Dentist Associates is a Dental Implant Center in Rockville Maryland. The Implant Dentist Kimberly Baer DDS, provide tooth replacement services from start to finish, from tooth extraction, implant placement and Porcelain Implant Crown placement. We serve primarily Rockville, Bethesda, Silver Spring, Wheaton, Potomac, DC, Gaithersburg, Kensington, Germantown, Burtonsville, Laurel, Columbia and Northern Virginia ( Mclean, Tysons Corner, Great Falls, Arlington ) but people travel from all over the country for our specialty and Holistic Dental Services.